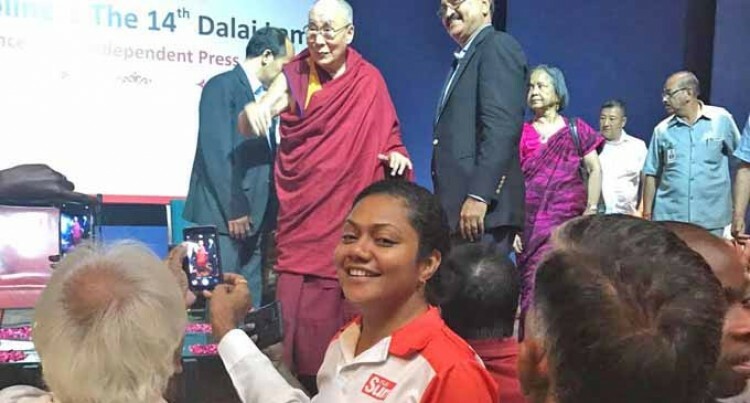 Fiji Sun Managing Editor Digital Rosi Doviverata in New Delhi, India, as a guest at an "Editors Guild of India" lecture on 9 August 2017 delivered by Nobel Peace Prize winner The Dalai Lama. The lecture was attended by top Indian editors and focused on press freedom. Two senior Fiji Sun staff members yesterday began attending a major conference in New Delhi, India, on Creating a Media Organisation of the Future. Managing Editor Digital Rosi Doviverata and Editorial Manager Soko Vakacegu are at the International News Media Association (INMA) South Asia Conference. It is attended by newspaper leaders from India, Sri Lanka, Pakistan, Bangladesh and Nepal. Fiji Sun Publisher/CEO Peter Lomas said the conference features speakers and best practice case studies addressing changing reading habits and the ways newsrooms need to evolve. “Newspapers still have a future,” Mr Lomas stressed. As well as attending the conference Ms Doviverata and Ms Vakacegu are visiting top Indian media houses to see their operations. This is being facilitated by Jai Kumar Sharma, a former senior Times of India group editor. His company Asia Media Design works with the Fiji Sun on development. They were also guests at an Editors Guild of India lecture on press freedom. This was delivered by the 14th Dalai Lama, the exiled spiritual leader of the Tibetan people and winner of the Nobel Peace Prize.